20 Tips For Dog Owners - #15 Is A Game Changer! Owning a dog is no easy feat! Whilst there's no doubt the sound of your favourite furry friend running to the door every night is a truly magical thing, bath times, walks and preventing them from eating anything and everything in sight is a different matter entirely. We're here to help make your life with dogs as easy and pleasurable it can be. Our twenty tips for dogs owners are so genius, you'll wonder how you didn't think of them before. Editor's Note: This post was originally posted in October 2015 and has been completely revamped and updated for accuracy and comprehensiveness in January 2019. 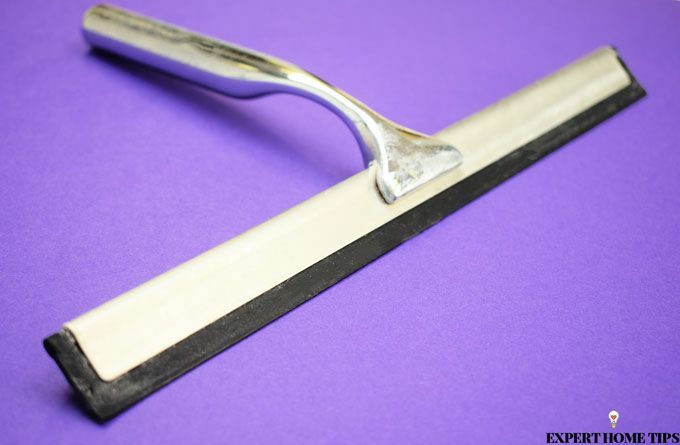 A squeegee is a cheap and cheerful way to gather up all their fur from your car seats, rugs or soft furnishings. You can also use rubber gloves to get the job done. Use a camping carabiner to quickly secure your dog's leash to a post - a neat little trick for when you're out and about and want to save time leashing and unleashing them. Bath time can be a nightmare, especially with a fidget bum! Pop a shower cap on your pup's head to avoid water and shampoo from trickling down their head and irritating their eyes. This little water bowl from Amazon is a must-have for walks, especially in warmer weather. It's a great little thing to have on hand whether you're at the park or at the pub so you can keep your dog well hydrated when you're on the go. Bark as much as they like - it's unlikely you'll understand exactly what your dog is after unless you learn to read their body language. The video above should help you on your journey to understand your best friend a little better. Love your dog but not their breath? Sprinkling a little parsley on their meals is a clever trick to keep the stench at bay. The addition of herbs will look pretty posh too! This is great hack for when your dog is left alone in your home. 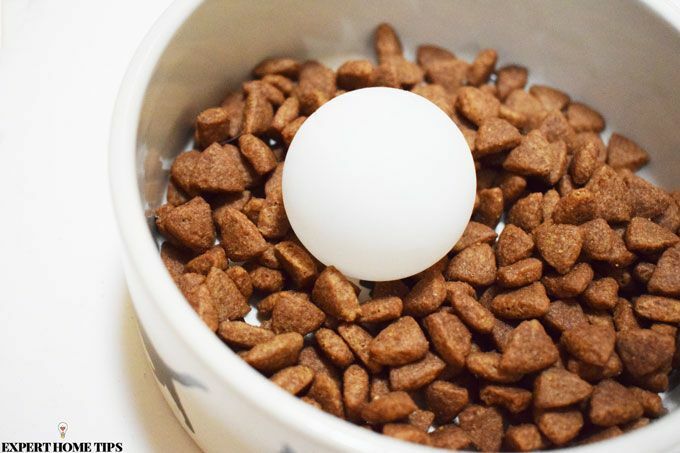 Deter them from getting up to mischief by distracting them with a DIY treat-dispensing toy. Simply cut a hole into a tennis ball, stuff some treats inside, and they'll be able to spend hours trying to free them. This next tip might be a bit sneaky, but if you're a dog owner, we're sure you'll understand! If your pooch has plenty of energy to spare and you don't, you can tire them out quicker on your walk or evening in the park by playing fetch downhill. They'll work harder to retrieve the ball and burn that energy far quicker. Eating too quickly can not only lead to overfeeding but also be bad for your dog's digestion, causing stomach aches and vomiting. A very simple way to help this problem is to place a ball in their bowl. They'll need to move it out of the way to get to the food which will help slow them down! If this doesn't work, try serving your dog's food in an old muffin tin. The food will be spread out so they'll have to take breaks moving from section to section. We all love an ice lolly during Summer - why not let your dog join in too? Keep your four-legged friend hydrated (and occupied) in the Summer months by freezing half water with half chicken broth in a bowl or cake mould. You can even freeze some dog treats, toys or bones in there too! Let the folks at IKEA hackers show you how to make this simple yet stylish dog bed from a Kallax unit. They're one of the most versatile pieces of IKEA kit you can invest in! Muddy paw prints can be the bane of any dog owner's life. 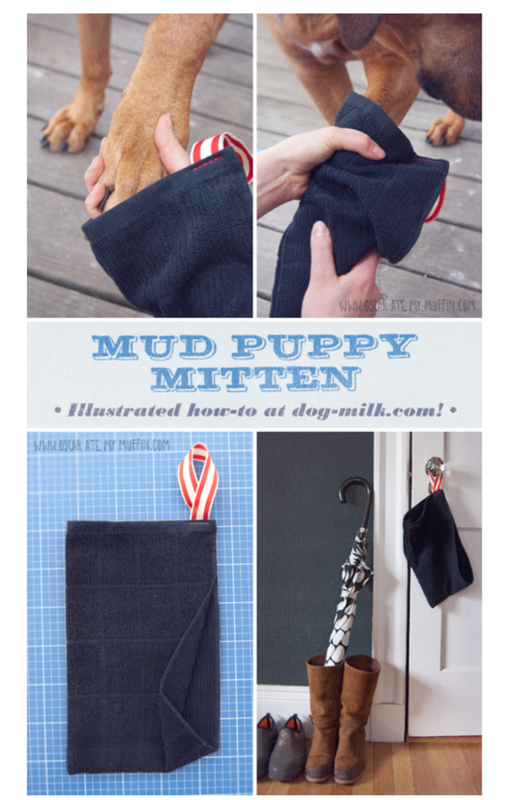 Create this very useful dog mitten using just a hand towel and hang it up by the door so you can clean their paws quickly and efficiently everytime they come in. Check out Oscar Ate My Muffin for details on how to make one. If you're in the car with your dog a lot of the time, invest in this Non-Spill bowl from Prestige Road Refresher. It'll keep your dog hydrated throughout those long journeys without you having to stop every time so you can get where you need to be, fast! Lavender essential oil is particularly soothing to the central nervous system, and when applied regularly between your dog's shoulder blades, it can also help keep fleas and ticks at bay. Keep them calm in long car journeys or exciting days like bonfire night by spritzing a lavender scent into the car/room. For a super stressed pooch, put a few drops of lavender oil onto a bandana and tie it around their neck. If your dog is driving you made by ripping up your stuffed toys or clothing (eek), you need to make a toy to prevent them ASAP. Start with a Hollee ball then stuff strips of old material and some treats. Stuff the treats inside and wrap layers around them for your pup to dig out. They'll love the challenge and will get the same satisfaction as tearing all your treasured belongings to pieces. Don't be tempted to eat these delicious treats. 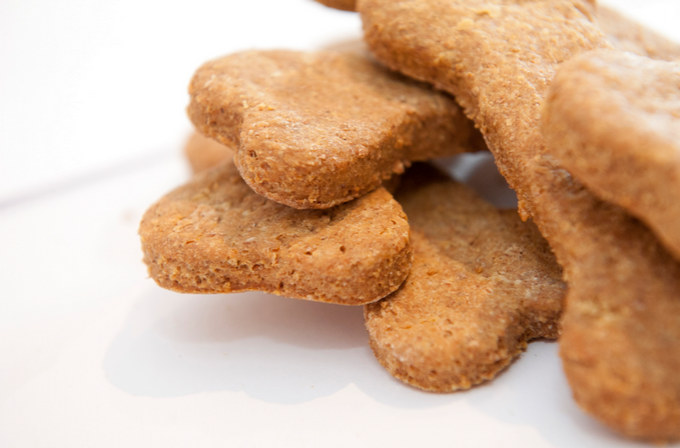 Did you know you can make your own dog treats with some kitchen cupboard ingredients? If you have flour, egg, chicken stock, salt and water then you can follow DIY Ready's easy-peasy recipe to make homemade dog treats. 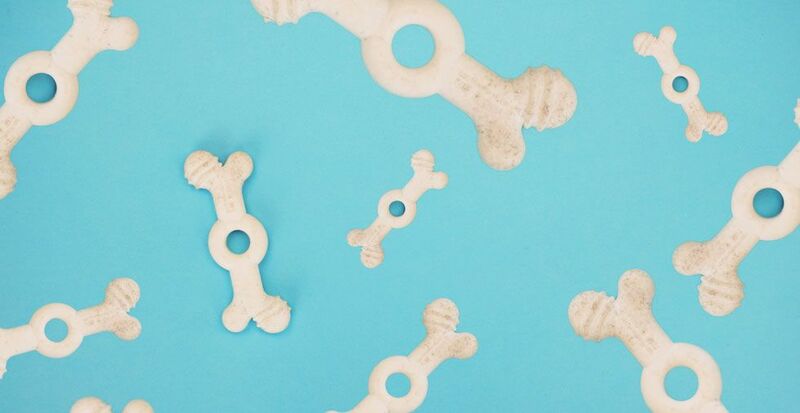 Your pup will love them and they're much cheaper than store-bought alternatives. It's not just chocolate that can be harmful for dogs. There are a number of potentially lethal foods that you wouldn't expect, including caffeine, chives, grapes and macadamia nuts. Head to Vets Now for a comprehensive list. Into vintage? Why not fashion a cosy dog bed using an old suitcase? It';l be super snuggle, and look the part too! If you dog doesn't like taking medicines in pill form, pill pockets can be a great solution. Made from just milk, peanut butter and flour, they're very easy to whip up and can be frozen for future use. Check out Mutt Nutt for the tutorial. 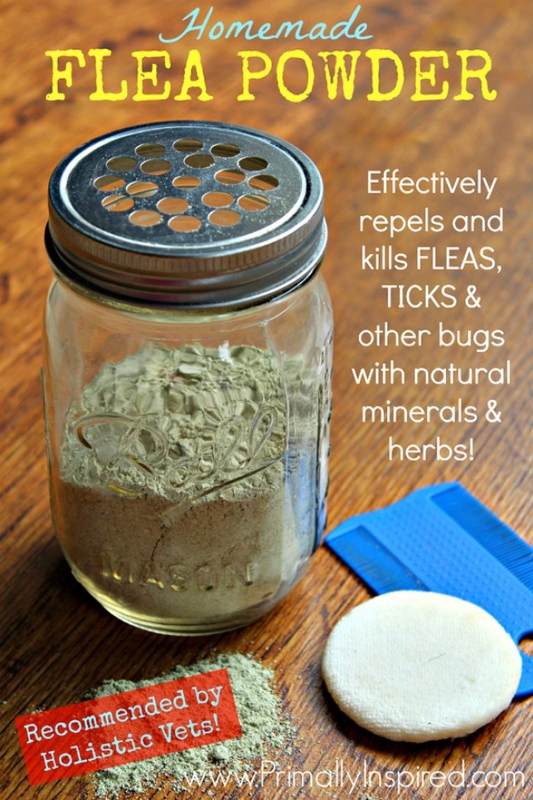 Avoid using harsh chemicals on your pet's fur and get rid of fleas and ticks the natural way with this home made flea powder. Read the Primally Inspired post on how to make your own and banish those bugs for good! We hope your life will be easier with our tips for dog owners! Share any of your own in the comments below. A keen money-saver and fan of all things natural, Anushka enjoys making her own beauty products and is partial to a bit of crafting. Never short of a clever tip or two, she's always looking for new ways to make her money go even further. Really fabulous comments but I have concerns over leaving a dog alone with a torn tennis ball filled with treats. I have heard of very sad consequences resulting from dogs choking on bits of tennis ball that have become lodged in the windpipe. Hi Tina, thanks for the comments! I suppose it would be up to the dog owner as to whether they felt comfortable leaving them alone with it. There can be more hazardous items around the home that a dog could harm themselves on, but it is a very valid point you make there. Good tips. Some I knew others not. About some of your dog tips saying no raw meat so why do some dog stores sell the raw meat and with eggs year's ago I was told to give my puppy soft boiled eggs so sorry do not agree with some comments of yours. Thanks Min. Let me know if you have any tips! Ice cubes and ice will kill a dog so I wont be doing that. Hi Karen, it seems like the warning to never give your dog ice or ice water is a viral story, however there may not be truth to it. Here is a very helpful article which explains further - http://iheartdogs.com/fact-or-fiction-can-ice-harm-your-dog-the-truth-behind-the-viral-story - hope it helps! Hi Christine, thank you I'm glad you found it helpful! No. 15 - Raw meat - dangerous for dogs. Rubbish! I, along with many many many others, feed my dogs on a raw meat diet. Bear in mind, where dogs come from originally, and their "natural" digestion etc... Please get facts right. Hi Jane, thanks for your comments. The infographic in No 15 was created by Labradors.com, as I understand it a raw dog food diet is designed to mimic a dog's natural ancestral menu. While they are rising in popularity, the raw dog food diet is still deemed controversial by some. I would like to think every dog owner will hopefully have researched this and will be able to decide what is best for their dog. Thanks! Doggy mittens?, I wish I could get my hands on some plastic paw covers. Hi Samantha you can find them on Amazon! Have a little search on Google, there are a few websites that do them. Welcome to Expert Home Tips – a beautifully curated collection of all the best home hacks, living tips, competitions and more.